How many times have you bought a stock on someone’s advice to make a quick buck and waited for months, may be years, to just recover your cost? Share trading, experts warn, is a risky game. However, it’s possible to play it smartly and make a quick buck as well, they say. It also depends on how much capital is available with you, how many opportunities you can explore and your knowledge of technical analysis. While any recipient of the so-called ‘hot tip’ can trade, making money consistently is possible only when you have sufficient knowledge of the markets and skills for technical analysis, which is the science of forecasting prices based on historical data. The software for technical analysis is available on the internet for free, but with limited features. Professional software capable of highly detailed analysis comes at a price. One should either have knowledge of technical analysis and the market or should have good technical consultant to help him. 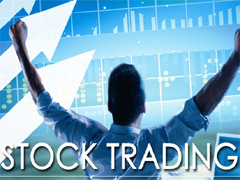 Stock exchanges, such as the Bombay Stock Exchange and the National Stock Exchange, offer courses in technical analysis. Another institution which offers such courses is Online Trading Academy. “People should trade only if they can take risk, control emotions, set targets and book profit/loss at the target point. While one can get many trading tips, their execution is important. It’s a battle of emotions. Trading is simple, but not easy. You have to be disciplined. The importance of discipline in share trading cannot be obver stressed. That is because in most cases, when people are making money, greed makes them wait for more, and so they don’t book profits. When prices fall, fear makes them sell fast. These situations can be avoided if they know when to book profit/loss. If losses are not a restraint and the market’s roller-coaster movements give you a high, here are a few habits and skills that can help you stay on the right track. These are useful for day traders as well as positional traders. The key to success is a stop-loss order. Stop loss helps a trader sell a stock when it slides to a certain price. Suppose you buy shares of company A at Rs 50 and set a stop loss at Rs 45. When the price falls to Rs 45, the shares will be sold automatically. This means you have limited your loss to Rs 5. While entering a trade, you should be clear about how much loss you are willing to accept. Trading is a skill, “You have to learn what not to do along with what you should do. You should also know how to spot amateurs and trap them and how to take positions. Also, you should be quick to get in and very quick to get out” .A lot of amateurs in the market buy at a wrong point. A skilled trader identifies such people and takes an opposite position to trap them. Only those with a capital of at least Rs 1 lakh can trade for a meaningful gain. However, this capital should not be borrowed and should not be part of your core savings. People can also trade with less, but volumes are important. So, a certain minimum capital is a must. What should you do with a share which has high volumes but not much price movement? You should prefer shares with a minimum price movement of Rs 10. This means the average difference between a stock’s intra-day high and intra-day low should be at least Rs 10. Any stock with a positive beta of 1 or above is good. A beta of 1 means the stock will move in line with the market. If the market falls 2%, the stock will also fall 2%. “One can look at a maximum beta of 2 or 2.5, not more than that”. One can find a stock’s beta in the trading software. One has to know the supply and demand of individual stocks. If the number of shares up for sale is more, one should not buy the stock, and vice versa. To know if the sell quantity is more or the buy quantity is more, one cannot rely on the bid and ask numbers available on the screen. Only a technical analysis can help identify the supply and demand in individual stocks. In future articles we will discuss in detail how one can trade using some charts and technical analysis. « Sensex will reach 21,108 in 2012 ? BigProfitbuzz is an Indian stock market advisory firm. BigProfitbuzz proven month after month that trading and investing in stock market can be profitable whether market is bull or bearNSE, NIFTY TIPS For the coming week from 30th dec Trader can make a buy position in NIFTY at the level of 6250-6300 with stoploss 6150 for the target of 6500-6600.One can also make a sell position in NIFTY 50 stocks with the stoploss as mentioned before. This will be the best strategy one can follow because now the time to NIFTY to show some consolidation. That’s why we are keeping sell positions. Trade only in the blue chip stocks to be in safe profits. If want good calls in the market then fill our trial form & get them. We believe in Low risk for sufficient profit.